Casey Jones, director of land management, now in his fourth year with ACRES, has made managing non-native invasive plants a priority. 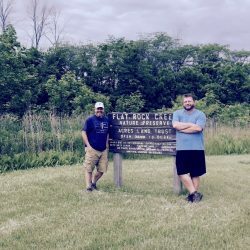 While some people can walk through the woods, take in the lush, green views, and be at peace, Casey Jones, ACRES’ director of land management, isn’t one of them. His trained eye goes straight to the clusters of non-native invasive species beginning to dominate certain areas. 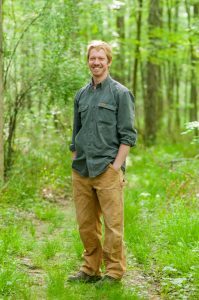 Now in his fourth year on the job, Jones has been tasked with (among other things) monitoring and improving the health of the preserves. For ACRES, that means figuring a way to manage invasive species within 6,500+ acres of property. If this sounds overwhelming, that’s because it is. Early in his tenure, Jones made land management a goal. “Our success with acquisition has made it hard to keep up with maintaining the properties,” he said. While work was done, efforts had been spread thin across the preserves. With a background in restoration ecology and native habitat restoration, Jones saw that spreading the efforts evenly wasn’t making a big enough dent. So ACRES shifted focus to a new strategy: knocking out infestations — or setting them back — by identifying a few problem areas and going after them aggressively. 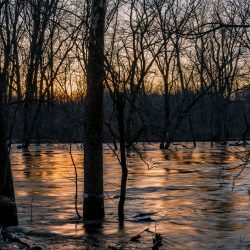 Jones and the ACRES Land Management committee prioritized Bicentennial Woods in Allen County, Seven Pillars Nature Preserve in Miami County, and the Walter H. and E. Marie Myers Nature Preserve on Flowers Creek, a newer Miami County acquisition (currently closed to the public). Of particular concern to Jones was Bicentennial Woods’ infestation of bush honeysuckle, a shrubby plant producing red berries. Jones worried that if nothing was done right away, the Honeysuckle might soon prove too invasive to be able to recover the property’s biodiversity. Bicentennial also was a logical choice because the interns reporting to ACRES’ main office could work nearby, instead of traveling across the region. ACRES also entered into a Natural Resources Conservation Service program to manage four connected properties along the Cedar Creek corridor. The goal there is to get ahead of some of the most common invasive offenders: autumn olive, bush honeysuckle, and multiflora rose. Jones hopes to continue strategic partnerships to tackle land management and deal with problems as they arise. “We weren’t expecting Japanese stiltgrass at all,” Jones said. The species, pictured courtesy The Nature Conservancy, had only been documented south of Marion County until it was recently found through nature preserve monitoring in Huntertown. One thing he knows: The work will never end. 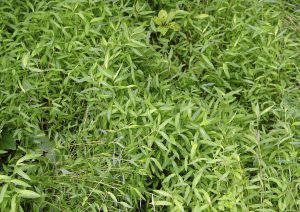 Jones and other land management professionals were caught off-guard by northeast Indiana’s latest invasive nonnative species, Japanese stiltgrass. The plant spreads by seeds carried on shoes or boots, and quickly displaces native plants on a forest floor. “We weren’t expecting Japanese stiltgrass at all,” Jones said. The species had been documented south of Marion County (it’s more common in central and southern Indiana), but in late 2015, it was first identified in Allen County in Little Cedar Creek Wildlife Sanctuary in Huntertown. 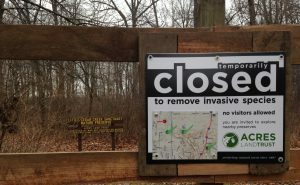 ACRES has temporarily closed this preserve while Jones works to eradicate the stiltgrass and prevent its spread. ACRES has temporarily closed Little Cedar Creek Wildlife Sanctuary while Jones works to eradicate the stiltgrass and prevent its spread. Jones explained that if Japanese stiltgrass were to get into the floodplains, it could spread very quickly. He hopes the outbreak, currently concentrated in one area, can be stopped by continuing the efforts already begun. “This could be an awesome success story,” Jones said. ACRES’ efforts in invasive species management currently are handled by staff, interns, contractors and volunteers. You can help fight non-native invasive species. 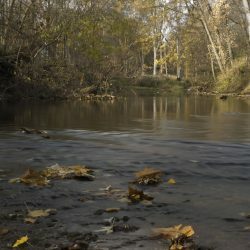 Learn more about the Autumn Olive project and how you can help, on the Tom and Jane Dustin Nature Preserve, on your own time.